PARIS — Thierry Henry is back where it all started. France's all-time leading scorer and an Arsenal great landed his first managerial job on Saturday after Monaco hired him as a replacement for Leonardo Jardim, who was dismissed this week. He's signed on as coach for three seasons, to June 2021. He starts on Monday. "I thank AS Monaco for giving me the opportunity to coach the team of this club which is so special to me," Henry said in a statement on the club website. "I am very happy to come back to AS Monaco and extremely determined to meet the challenges ahead. I cannot wait to meet the players to start working together." "Thierry is ready to be head coach in a club," Martinez told L'Equipe newspaper in an interview published this week. "He likes what he does, and enjoying it is an essential part of this job." 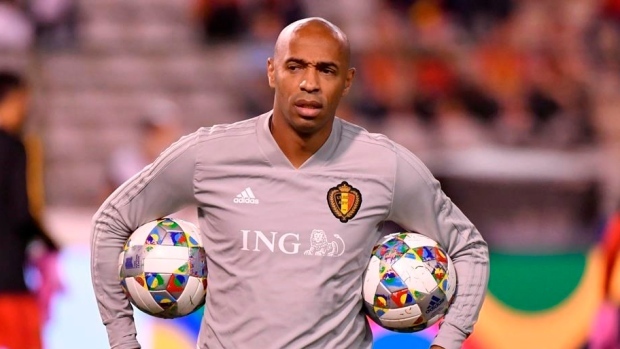 At Monaco, which is winless in its past 10 games in all competitions, Henry's first task will be to get the team back in contention in the league. A traditional powerhouse in French football, Monaco secured top-three finishes over the past five seasons and won the 2017 league under Jardim but is currently in 18th place in the standings, and in last place in its Champions League group. "Thierry is both aware of the task ahead and eager to start his new job," Monaco vice-president and CEO Vadim Vasilyev said in a statement. "He can count on our trust and all our support to bring a new dynamic to the team and carry out the mission. "His knowledge of football, his passion for the game, his high standards and his commitment to our colours make his nomination a reality." Henry's first-class career was launched in 1994 by Monaco coach Arsene Wenger, who also five years later brought him to Arsenal. Wenger promoted Henry to Monaco's first team after the fast and technically gifted forward scored more than 30 goals with the under-17s in one year. Aged 17, Henry played his first French league game in August 1994. He ended up playing 141 matches in all competitions with Monaco, winning the 1997 league. At Arsenal, he joined the pantheon of modern greats. He scored at least 20 league goals in six consecutive seasons and became Arsenal's all-time leading goalscorer. He won seven trophies with the Gunners, among them two Premier Leagues, including the unbeaten 2003-04 side. Henry holds the French record of 51 goals in 123 internationals. He won the 2000 European Championship but finished on a low. In 2009 came the infamous handball in the decisive goal against Ireland in a World Cup playoff. At that World Cup in South Africa, France didn't win a game, and caused a scandal when it refused to train before its final match. Coach Raymond Domenech arguably played his part in the debacle by dropping the hugely influential Henry from the starting lineup and souring a fragile atmosphere within the squad. It was a sad and humiliating end to Henry's international career when he made his final appearance as a second-half substitute, with his shell-shocked side trailing South Africa 2-0 and heading for the exit gate. AP Sports Writer Jerome Pugmire contributed.